It’s Rose-O-Rama season in our garden! 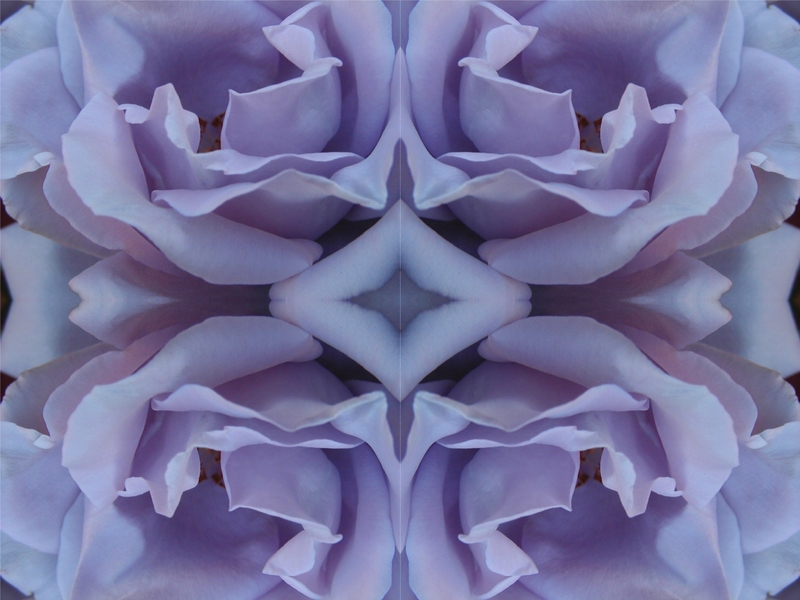 Our Blue Girl, Graham Thomas, Butterscotch, Sally Holmes, Ispahan, Electron, Heirloom, Double Delight … and many more … are blooming like gangbusters, so I’m extra excited this year about the 33rd Annual Celebration of Old Roses, the very best event in El Cerrito. Always held the Sunday after Mother’s Day, this year it’s on May 19th, from 11:00 to 3:30. Sponsored by the Heritage Roses Group, it’s at the El Cerrito Community Center, which is just a few blocks east of the main drag in El Cerrito (San Pablo Avenue), at 7007 Moeser Lane (cross street Ashbury Ave). The event and parking are free, and it’s wheelchair-accessible. The heart of the Celebration is the 100-foot display of roses. 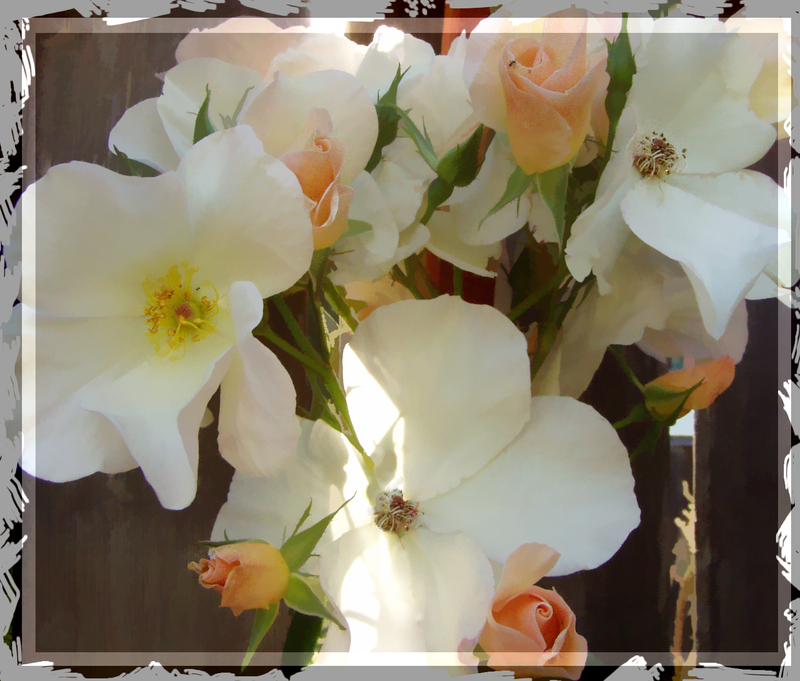 Everyone from expert rose cultivators to people who just have one rose bush in their yard bring cut roses to share and show off. The roses are arranged by type, so just by cruising the collection you’ll get an education in rose-ology! Have a rose that you can’t identify? Bring a bloom and get an expert’s opinion. In addition to the rose display, there’s a great collection of arts and crafts and rose-related products for you to enjoy -a wonderful chance to get gifts for the rose and nature-lovers in your life. 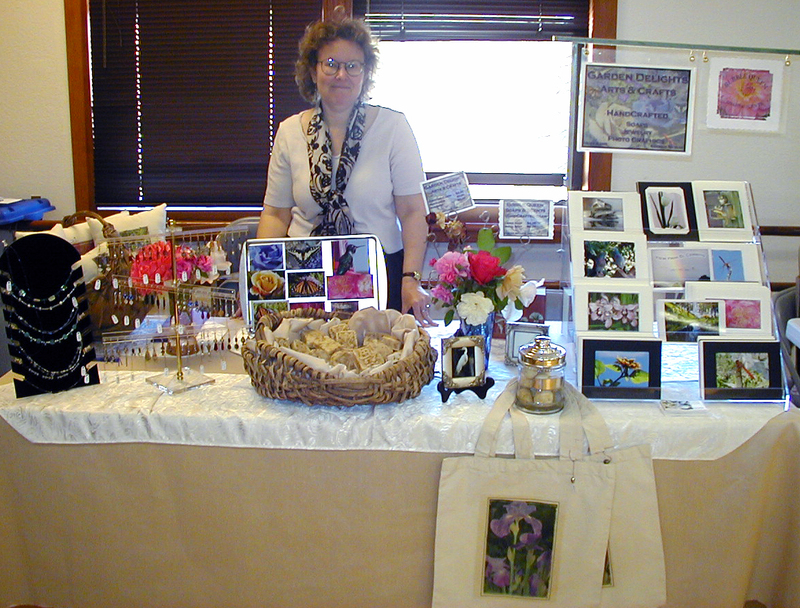 I’ve had a table with my artwork and crafts at the Celebration for the past eight years, and I’ll be there with the things I make from my original photographs, rose and flower-related, including jewelry, scarves, decorated boxes, purses, cards, prints, and much more! 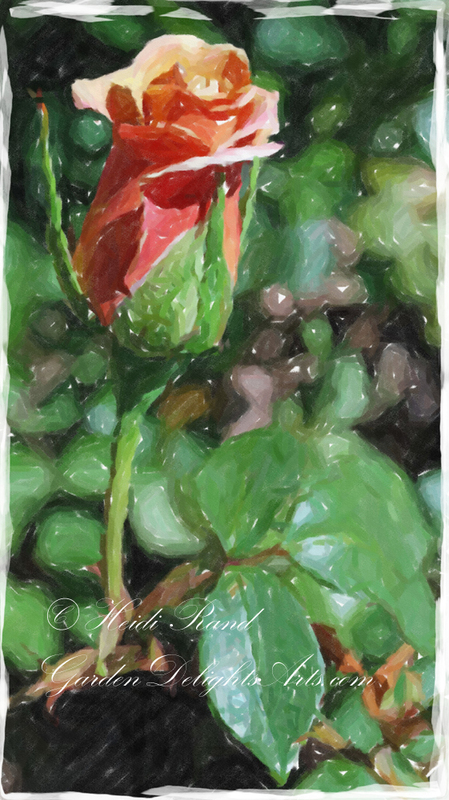 How are the roses blooming in your garden? What’s your favorite rose? Impossible to choose? Well, I have just the event for you — the 32nd Annual Celebration of Old Roses, one of the best happenings in El Cerrito, is coming up next month. Always held the Sunday after Mother’s Day, this year it’s on May 20th, from 11:00 to 3:30. Sponsored by the Heritage Roses Group, it’s at the El Cerrito Community Center, which is just a few blocks east of the main drag in El Cerrito (San Pablo Avenue), at 7007 Moeser Lane (cross street Ashbury Ave). The event and parking are free. In addition to the roses (including heirloom and hard-to-find roses from specialty nurseries), an array of arts and crafts and rose-related products will tempt you — just view, or purchase if you can’t resist! You’ll find jewelry, china, books, cards, prints, calendars, honey, and much more! I’ve had a table with my artwork and crafts at the Celebration for the past seven years. I’ll be there with the things I make from my original photographs, rose and flower-related, including jewelry, scarves, tiles, boxes, vases, sachets, and much more! Go to smell the roses, then stop by to say hello… If you have any questions about the show, please email me at HeidiRand [at] gmail.com. 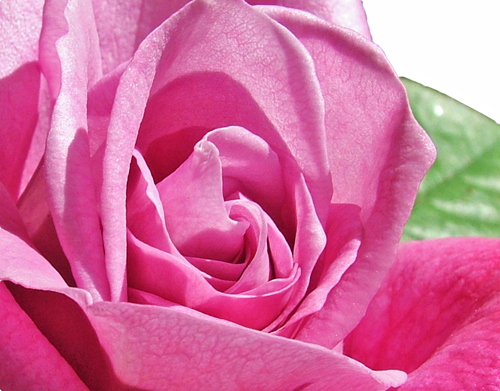 Ahhh, it’s rose season again … Are yours blooming yet? What are you seeing in your neighborhood? Ours just started busting out with the few not-too-cold days we’ve had. The ever faithful Sally Holmes is climbing our fence, the Ispahan that George cut way back last season is starting to bud. 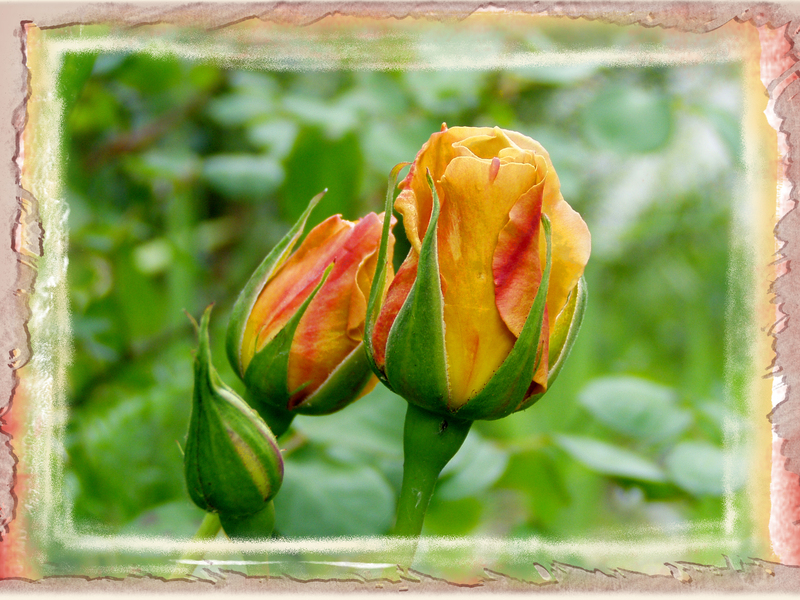 The Blue Girls aren’t blooming yet, but the Graham Thomas and Butterscotch (both yellow roses) are doing great. 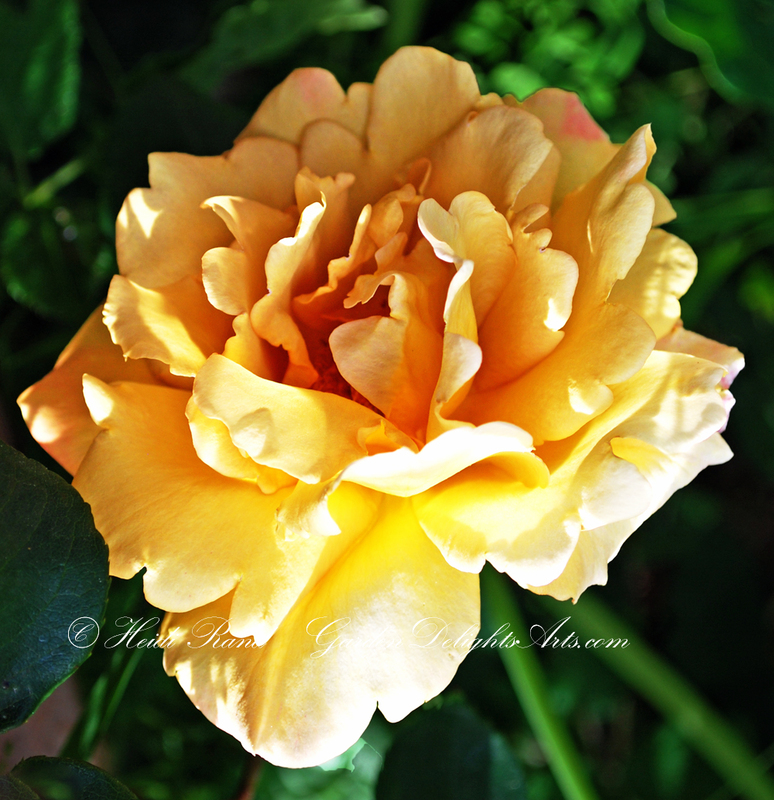 This is a butterscotch rose. No scent, but it’s a stunning rose with colors that range from rich caramel to full yellow, with blushes of pink on the edges. Oh, what timing! George just handed me an incredible Heritage rose that’s in full bloom and smells heavenly. And coincidentally, the 31st Annual Celebration of Old Roses, one of the best events in El Cerrito, is just around the corner. This year it will be held on Sunday May 15th, from 11:00 to 3:30 (the week after Mother’s Day). It’s sponsored by the Heritage Roses Group and will be held at the El Cerrito Community Center, a few blocks east of the main drag in El Cerrito, San Pablo Avenue. The Center is at 7007 Moeser Lane, cross street is Ashbury. The event and parking are free. In addition to the roses, an array of arts and crafts and rose-related products will tempt you — just view, or purchase if you can’t resist! I’ve had a table with my artwork and crafts at the Celebration for the past six years. 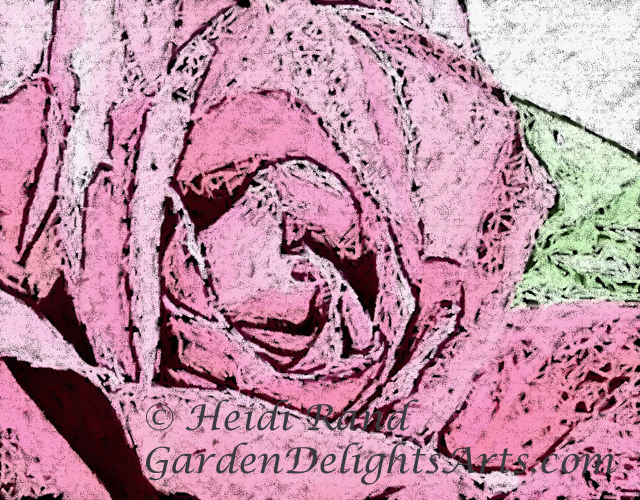 I’ll bring the work that I make from my original photographs, rose and flower-related, including jewelry, scarves, tiles, boxes, vases, sachets, and much more! 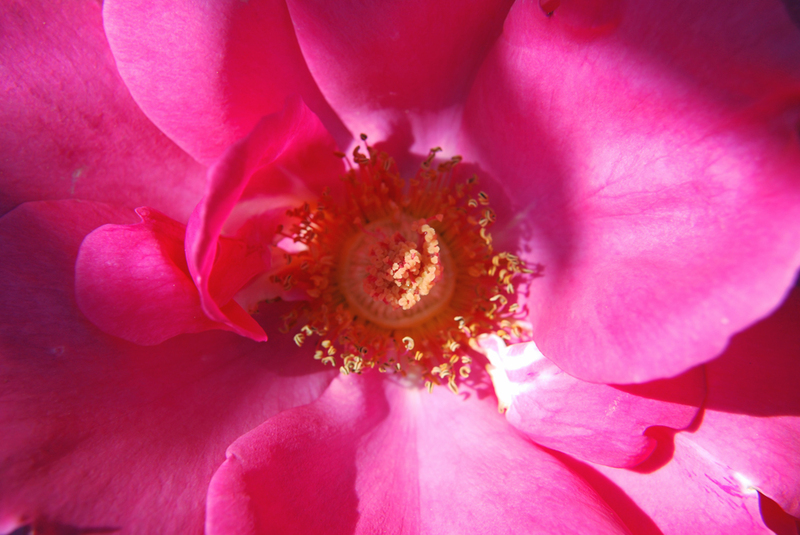 Go to smell the roses, then stop by to say hello… If you have any questions about the show, please email me. 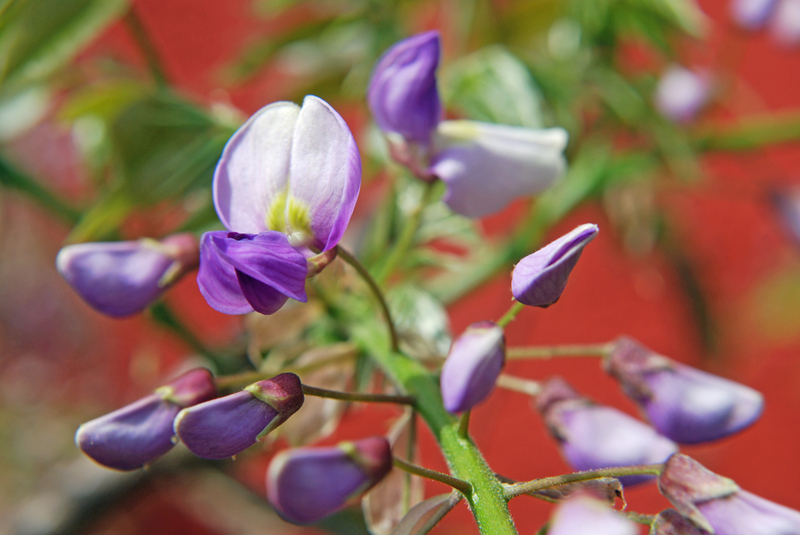 Ahhhh … the wisteria tree is blooming in the back garden … one of my all-time favorite flowers. Too bad you can’t smell it – it has a delicious light scent to go along with that incredible color. You know George is an orchid wizard. 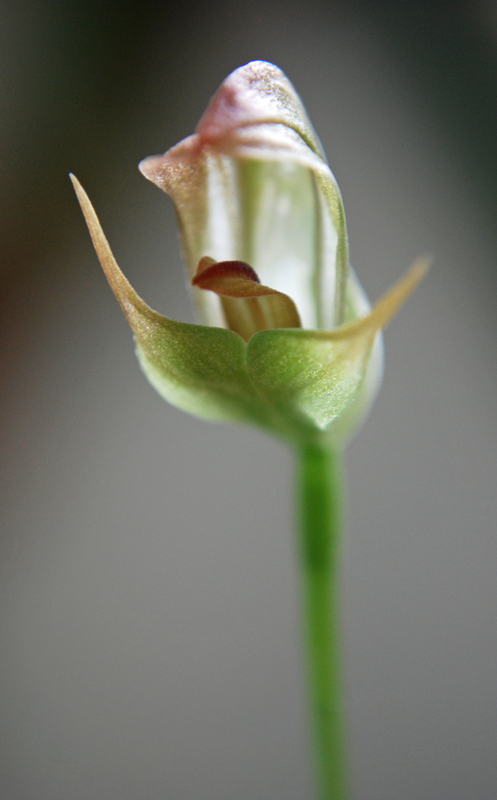 This is one of many orchids he has blooming right now, a Pterostylis. 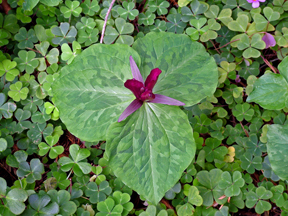 The flower is small, a bit more than a half inch. 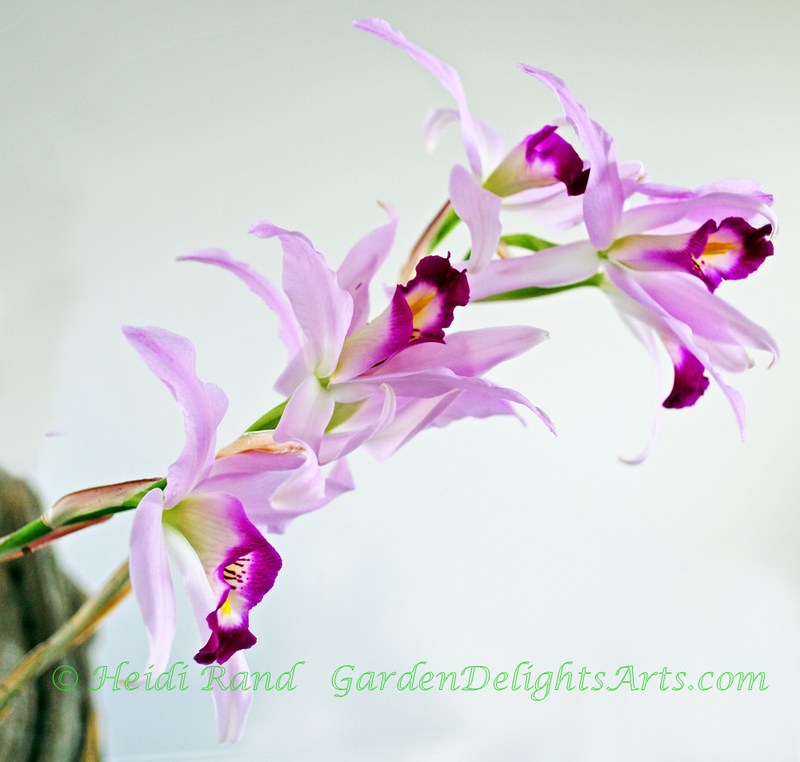 Another orchid — this one’s a Laelia Anceps, much larger than the Pterostylis, it has multiple flowers on long stalks. 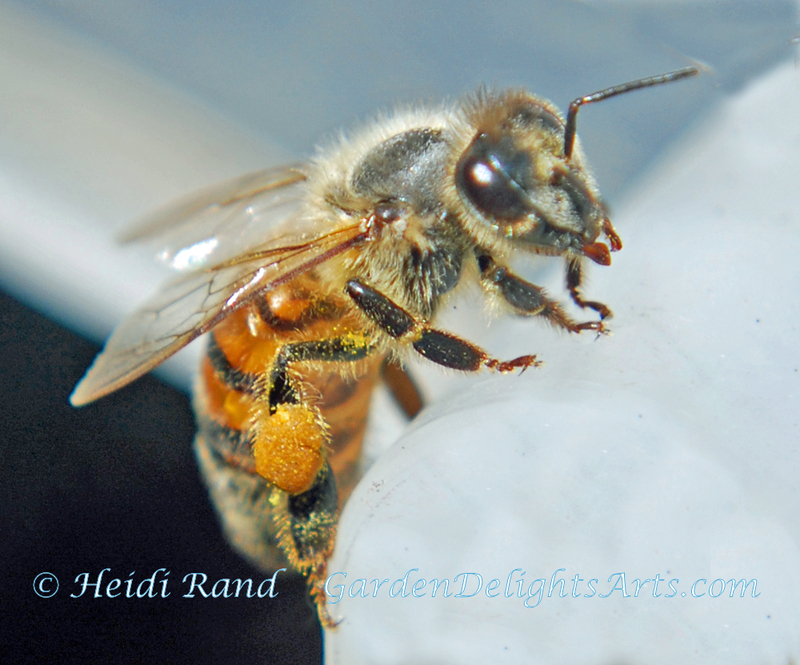 April is good to the hardworking pollinators. They’re usually so busy flying around that it’s hard to get a good closeup photograph of them, but I managed to get one shot of her when she landed for a moment on my leg. 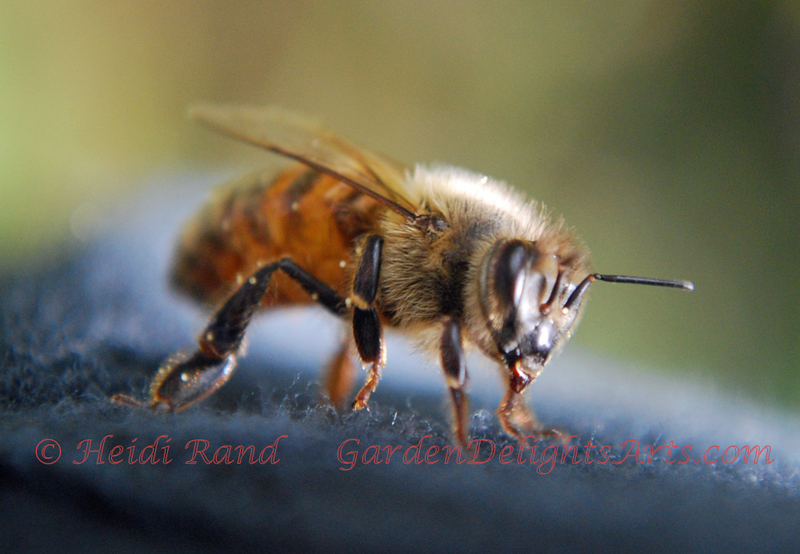 Here’s one laden with pollen! Got to get out to the garden now to see what else is blooming. What’s happening in your garden? Let us know in the comments! The East Bay Chapter of the California Native Plant Society presents the 2010 Native Plant Fair at the Native Here Nursery, 101 Golf Course Drive in Tilden Park, Berkeley. Fair hours are 10 to 3 on Saturday, October 16 and noon to 3 on Sunday, October 17. 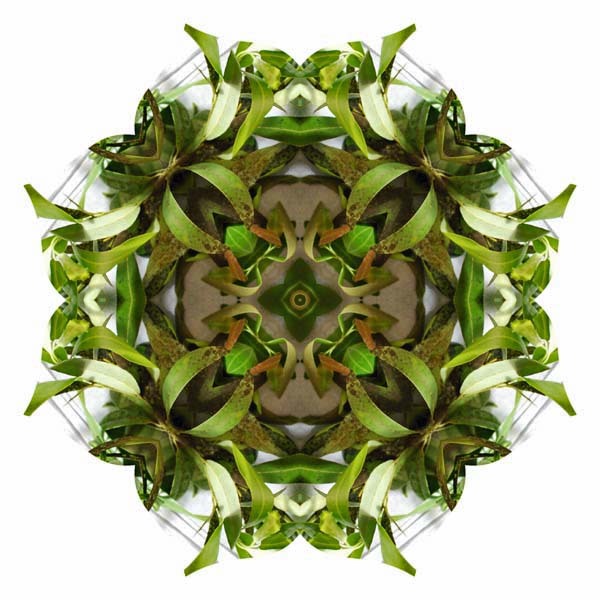 Come for a wonderful selection of local native plants, seeds and bulbs, lectures, books, posters and gifts — as well as to see the local photographers and craftspeople with their native and nature-related arts and crafts. Free admission! I will be there both days — please stop by my table to say hello. 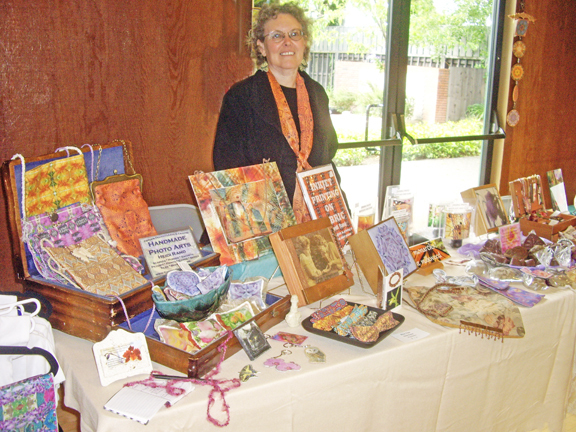 I’ll bring a great selection of my original nature-based arts and crafts works, including many prints of native plants, butterflies and insects, my fabric art, tile boxes, and much more! 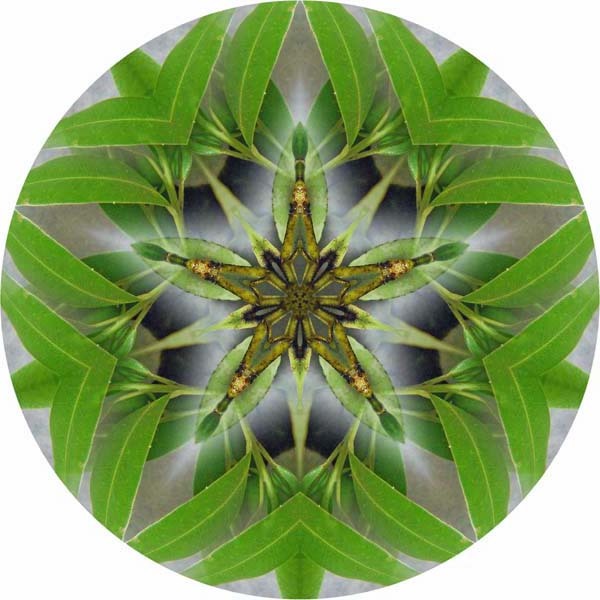 I also have a new series of mandalas and mandalas that I created from my photograph of the California native Bay Leaf. 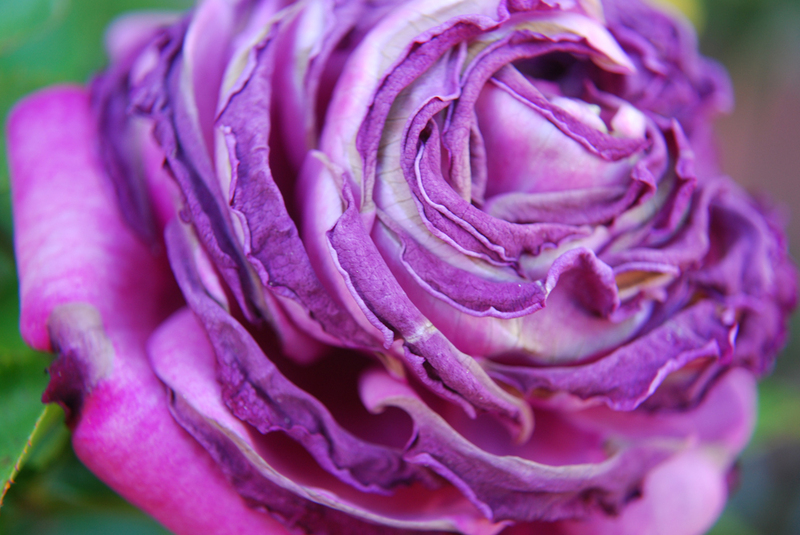 Is your garden exploding with roses like ours? We have the most intoxicating roses climbing the fence (Sally Holmes), draped over the trellis (Ispahan), peeking around the orange tree (Double Delight), trying to hide from the deer (Blue Girl), climbing up the willow tree, and just blooming gloriously (Graham Thomas, Butterscotch) ….. So timing couldn’t be better for the yearly Celebration of Old Roses, sponsored by the Heritage Rose Group, and held the Sunday after Mother’s Day. This year the Show will be this Sunday, May 16th from 11 am to 4:30 pm. It’s at the El Cerrito Community Center, a few blocks east of the main drag in El Cerrito, San Pablo Avenue. The Center is at 7007 Moeser Lane, cross street is Ashbury. The event and parking are free. In addition to the roses, an array of arts and crafts and rose-related products will tempt you — just view, or purchase if you can’t resist! My favorites include a vendor who sells rose and nature themed books, and two vendors who offer rose flavored jellies and jams and locally-produced honey. I printed the image on TAP using the recommended settings (media set for plain paper, resolution at fine quality). The TAP print looked great, pretty much what like the image looks like on treated inkjet paper. I cut an untreated piece of lutradur inches larger than the image, because if it turned out well I figured I might do something fun with the edges, like use a heat gun to curl them. I heated my iron to the highest setting. I put the lutradur on my ironing surface, which is relatively hard and not as padded as a normal ironing board. I cut the excess TAP from the edges of the image, as recommended. I positioned the TAP printout face down onto the lutradur, and placed a piece of parchment paper on top of the TAP. Pressing down firmly, I held the iron in place for about 10 seconds, then moved the iron to another spot until I had covered the entire surface. I peeled up an edge and saw that it had transferred completely. I checked the other edges and had to place the TAP down and re-iron a few spots. After making sure the entire transfer had adhered, I peeled the TAP paper off. I think the transfer is beautiful! The color and resolution are nearly as perfect as an inkjet paper print. I love the way the translucency of the lutradur allows light to shine through the image, and how the filaments and texture complement the image. I also think the abstract nature of the image, with its rich tones, worked really well on the lutradur. I think if you pick the image carefully, a TAP transfer to lutradur is a great option. I’m not sure how well fine details will transfer, but I think that this abstract image with its rich colors worked great. Considering that in order to print this image directly onto the lutradur I would have to coat it with Golden’s Digital Grounds (see my other blog posts on that subject), using the TAP was certainly quicker and easier. When I decide how to finish the piece I’ll post an update.